Final Four Pizza Giveaway Contest! Enter to win $50 Worth of Gift Cards For Your Final Four Party! Want to be the hit of your Final Four party? Enter now for a chance to win $50 in MOD pizza gift cards for your next party! Hurry and enter now to win the Final Four Party Giveaway the deadline is April 5th, 2019! At Men on the Move love giving back to our customers and communities in the Greater Metro Detroit area. So it is great when we have the opportunity to give away prizes and deals to all our loyal customers and friends! We have teamed up with MOD Pizza to give one lucky winner a $50 gift card! It’s simple and easy to enter! 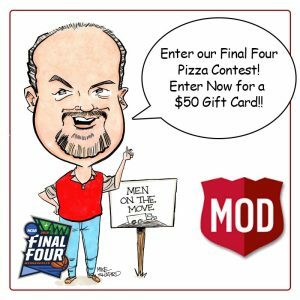 All you have to do is fill out the form above and you are entered to win our “Final Four Party Giveaway” to MOD Pizza. Mod Pizza was started in 2008 by a husband and wife out on the West Coast who wanted fresh and quality fast food. They treat their employees right and have only the freshest and best ingredients for their pizzas. With stores locally in Livonia, Northville and Canton, and 8 total now in Michigan (see below), you won’t have far to go to find the nearest location! No strings attached. The winner will be drawn at random from the entries on the MichiganMovers.com website. Past winners include S. Mills and D. Perttola and the next winner can be you!